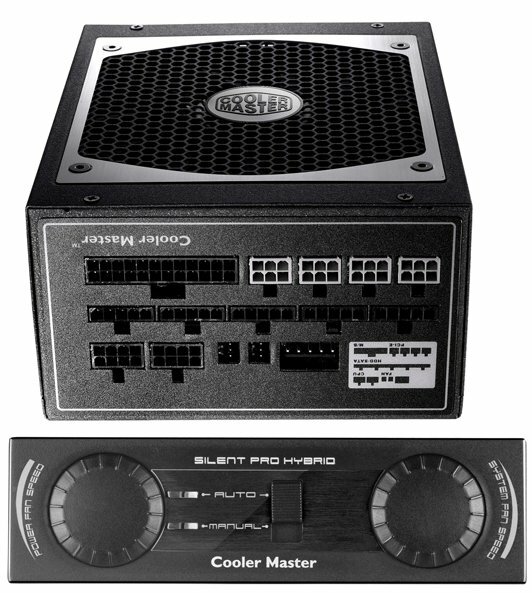 Cooler Master introduces the Silent Pro Hybrid, a new power supply series with 80Plus Gold certification. The units are available in 850W, 1050W and 1300W editions, they promise silent operation and are the first power supplies to offer a fanless mode when system load is under 200W. Cooler Master, an industry leading chassis, thermal solution, peripheral, and accessory manufacturer, is proud to announce a world’s first in power supply technologies, the Silent Pro Hybrid Series. Equipped with fully modular cables, centralized control of power supply and system fans, a noise-free operation mode, and an included 5.25” drive bay fan controller module, the Silent Pro Hybrid Series becomes the industry benchmark to aspire to. Silent Pro Hybrid represents a paradigm shift in the way power supplies will be perceived within a system setup. It includes the features that many enthusiasts demand such as full control over cable management with fully modular cables, over 90% efficiency with 80Plus Gold Certification, noise-free operation, and other value-added features that ensure these users get the most out of their purchase. With a power supply integrated 7V fan power port and included 5.25” drive bay fan controller module, the Silent Pro Hybrid Series removes the middleman by taking an unnecessary load off of the motherboard. This direct connection between power supply and fan controller provides the user with immediate on-the-fly control over the 135mm Super Silent Hydraulic Bearings power supply fan and up to 3 other system fans. The power and system fan speeds are adjusted independently via two dials. Users may determine the level of control they would like to wield by switching between automatic and manual modes for the power supply fan. The first to offer a “fanless” mode, the Silent Pro Hybrid Series seeks to eliminate unneeded fan noise. The power supply fan can be completed turned off to essentially operate as if it were fanless. This mode persists until loads become greater than 200W. At this point, a safe mode will activate the fan and cool according to the level of the load. Needs differ between systems and a fully modular cable setup allows the user to determine what is critical to their setup. This individualized approach provides for easier management of cables that open the door for a professional cable routing look with less overall effort. Maintenance and upgrades on the main power supply unit become extremely efficient and effective. Upgrade from one wattage to another by simply detaching all cables from the power supply and replace it with another, more powerful, unit in the Silent Pro Hybrid Series. All of this is done without disconnecting cables from the system itself. A computer can now be back up and running to work or game in a matter of seconds. The Silent Pro Hybrid Series will come in 850W, 1050W, and 1300W models and will be available worldwide in October 4th, 2011 for $299.99 (1300W), $249.99 (1050W), and $199.99 (850W) at retail and online locations that carry your favorite Cooler Master, CM Storm, and Choiix products.